This colourful meat-free supper is as appetising as it looks. If you’re serving fewer than six people, pair any leftover cakes with a salad for lunch the next day. 1. Preheat the oven to 200°C, gas mark 6. Cut the sweet potatoes into chunky chips and toss with a little oil and the cayenne. Spread out evenly in a large non-stick baking tray and roast for 25-30 minutes, stirring once or twice until tender and nicely browned. 2. Meanwhile, cook the kale in a large pan of boiling water for 1 minute, then add the peas and cook for a further 2 minutes until the kale has wilted. Drain well, then pat dry with kitchen paper and transfer the kale and peas to a food processor. 3. Grate the zest from the lemon, then add to the food processor with the remaining ingredients. Pulse to make a coarse mixture. 4. Heat a little oil in a large non-stick frying pan and cook spoonfuls of the mixture, in batches, for 4-5 minutes each side until golden. Keep warm in the oven while you cook the remainder – you should have 18 in total. 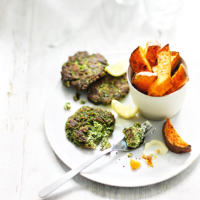 Serve with the sweet potato chips and lemon wedges.